As a business owner, your website is one of the many ways to generate sales online. One of the tools you probably integrated is a newsletter signup! (If you don’t have one, read up on one of our other blogs to see the importance of having one). Newsletters are such a great tool for any business owners to market to their customers on their website. 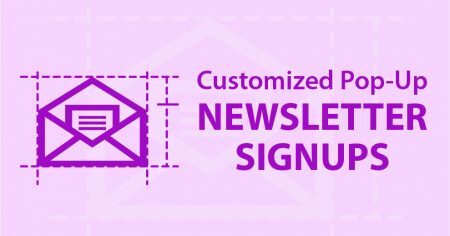 Now, you’ve tried to get people to sign up for your newsletter but the problem is, no one signs up. Having a standard signup box is perfectly fine, however, we always want to maximize different methods to really engage with your viewers. Of course there are various ways to utilize the newsletter signup, but we’ll mainly be focusing on timed pop-up email signups,as well as pop-ups on specified pages! 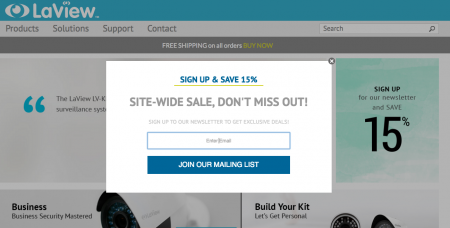 One of the most common newsletter signups seen today is a pop-up email signup box. It can beset up where it only appears on the home page, and we would absolutely recommend having some logic behind the programming so that it will only appear once for each unique visitor. Imagine the frustration it would cause your customers if they saw the pop-up email signup box every time they get on your website;that could easily contribute into your bounce rate percentage (see article here from our marketing expert). The purpose of the pop-up email is more aggressive, and needs to send out avery strong message so that it will entice your viewers to actually sign up. An example below is from our client – www.laviewsecurity.comthat mentions a 15% discount on their home page to anyone that signs up, along with future promotional offers. Of course, the most effective and engaging newsletters will need to either provide exceptional information/education to our viewers, or some sort of coupon code for your E-Commerce buyers. Just remember, every email you gather is a potential customer/sale/lead/conversion! Another powerful method of utilizing your email marketing is to have a timed newsletter pop-up on specific pages. The goal is to collect valuable emails without bombarding them while they are browsing through your website. The relevancy and timing of these pop-ups are very important. One critical rule is to not set up the pop-ups on pages that are not product related such as – shipping/return,create account, shopping cart, log in, etc. You can even set it as far as popping up after the customers have viewed 3-4 products (Targeting real interested customers, who have reason to purchase after viewing a few). 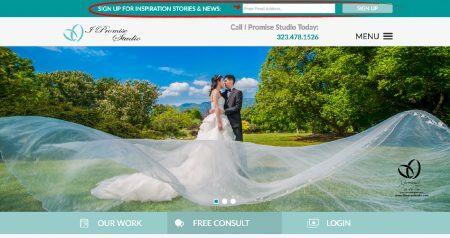 If your website is based on information such as a services company (real estate, dental office, salon services, etc. ), you can still do targeting with timed pop-ups!Again, just make sure that you are timing it in the right pages, with an engaging message, and be sure to not pop-up on the same visitors every time!